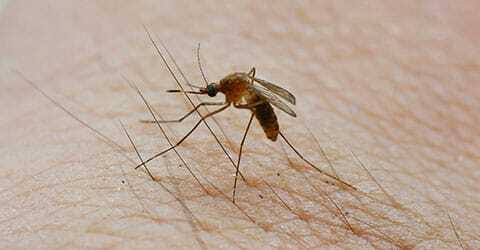 Disease transmitting mosquitoes and ticks are typically a problem in Illinois and Iowa as early as March and as late as October. Spring rains and warmer temperatures allow breeding to occur, especially around properties that have a good amount of moisture, shade and vegetation. Ornamental ponds, bird baths, and outdoor play equipment can quickly become a suitable habitat for the female mosquito to lay her eggs- as long as the water remains stagnant. Low-growing ground cover creates a dense environment that not only retains moisture, but encourages mosquitoes and ticks to rest during the warmest hours of the day. Ticks gain greater mobility by latching on to humans and domestic animals passing by. Swatting at mosquitoes and avoiding your backyard over worry about ticks is no way to enjoy your summer, contact Quik-Kill Pest Eliminators for professional mosquito and tick control that protects your family and pets! At Quik-Kill Pest Eliminators, treatment for mosquitoes and ticks is comprehensive by design. Our entomologists have created a three step program that is as thorough as it is effective. Step 1: We begin by conducting a complete inspection of your yard and surrounding property to identify where mosquitoes reside and breed. Step 2: Our pest control professionals will apply an adult mosquito treatment which provides immediate knock-out and relief. We utilize a specialized mosquito misting system to provide a repellant treatment to foliage areas around the property, paying special attention to areas that retain moisture (i.e. bushes, shrubs, under decks, boundary areas, etc.) -performed once a month during peak periods of mosquito and tick activity. Step 3: We’ll limit mosquito populations by treating breeding areas with a biological mosquito larvicide that stops the development of larvae at its source! Each mosquito and tick treatment can give you up to four weeks of relief – which is a lot of time to enjoy the outdoors during those balmy summer days and nights. Our mosquito and tick control program will reduce the numbers of these annoying and potentially dangerous insects. Concern for human health and educating the public is a top priority at Quik-Kill Pest Eliminators. Mosquitoes are a public health problem in most parts of the world including our region. These biting insects have the ability to spread serious diseases to people including West Nile virus, Encephalitis, and Zika. According to the American Mosquito Control Association, mosquitoes carry diseases and parasites like dog heartworm to dogs and horses as well. It is impossible to stop mosquitoes completely given their ability to fly but Quik-Kill’s mosquito control services reduce mosquito populations and eliminate potential hiding and resting sites. Deer ticks – also known as blacklegged ticks- are largely responsible for more than 300,000 reported cases of Lyme disease each year. Lyme disease is a serious illness many people never fully recover from. The illness manifests as a bacterial infection transmitted through the bite of an infected deer tick. 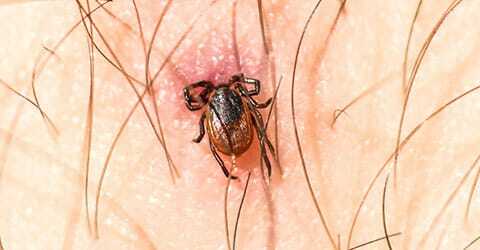 While early signs of Lyme disease may resemble a bullseye rash accompanied by symptoms resembling the common flue, debilitating the effects of the illness can appear over weeks and months if left untreated or misdiagnosed. Ticks prone to carrying the bacterium that cause Lyme disease are under leaf litter and snow or in cases of mild winters, ticks emerge early from protected areas and will be carried on rodents, deer and birds. While prompt removal of ticks can help prevent infections, avoiding tick bites completely is the best course of action.